A slide costs you nothing so don’t be afraid to split busy slides into several ones. 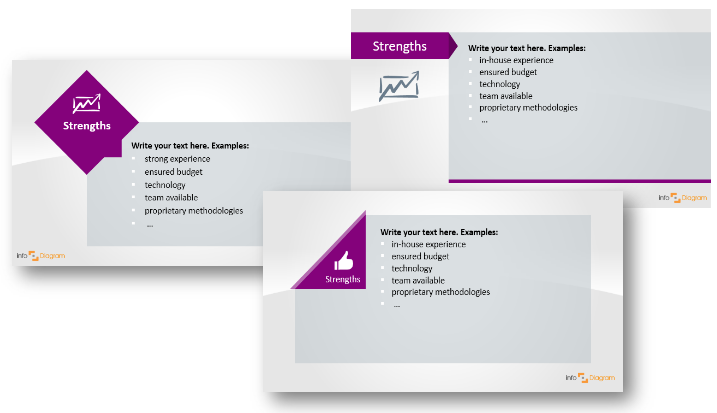 SWOT matrix can be enormously effective while analyzing your products, building strategies and plans or evaluating your team’s performance or even yourself. 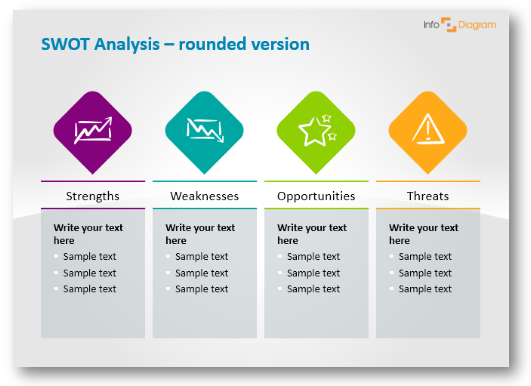 A SWOT analysis is a useful tool for brainstorming and strategic planning. You’ll get more value from a SWOT analysis if you conduct it with a specific objective or question in mind. stop an organization from performing at its optimum level. They are areas where the business needs to improve to remain competitive. There is no better way to show this concept as thumbs down, arrow, which is going down and minus pictogram. refer to favorable external factors that an organization can use to give it a competitive advantage. How would you show opportunities? We asked ourselves the same question 🙂 When you’re talking about strong and weak sides, it is pretty easy to show them. However, how to illustrate opportunity with just one icon? We brainstormed and here’s what we’ve come up with (pretty cool as we think 🙂 ): you can use a star as it is a good indicator of new possibilities, a light bulb – a symbol of new ideas and an arrow, going up. Threats are factors that have the potential to harm an organization. Common threats include things like rising costs for inputs, increasing competition, tight labor supply and so on. The symbolism of danger and threat can be perfectly interpreted as a question mark and symbol of lightning. When using SWOT, an organization needs to be realistic about its good and bad points. 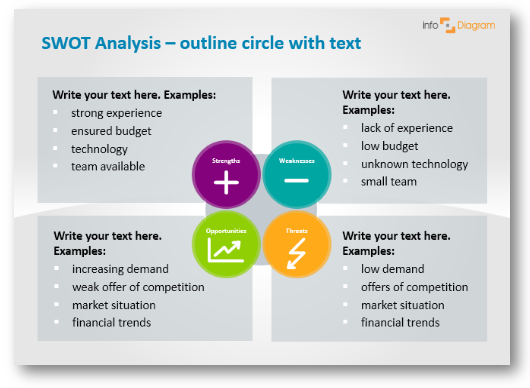 Analysis needs to be kept specific by avoiding gray areas and analyzing in relation to real-life contexts. check this blog of guys from Cayenne Apps – they wrote interesting SWOT of companies like a NEST, Netflix, Toyota or Nike. here’s another a real-life example of using SWOT in small start-up consultancy. 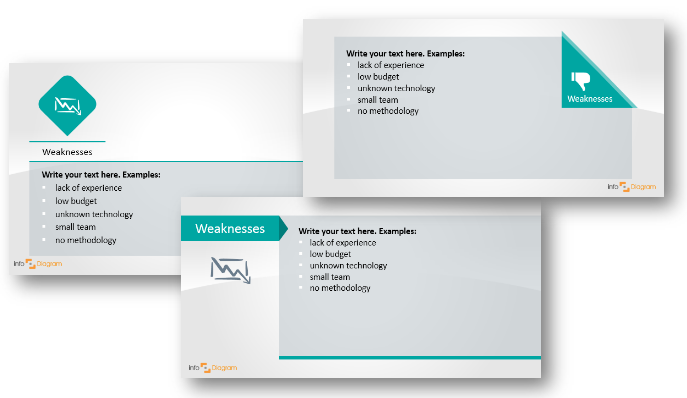 Examples above are using SWOT presentation template, we designed. 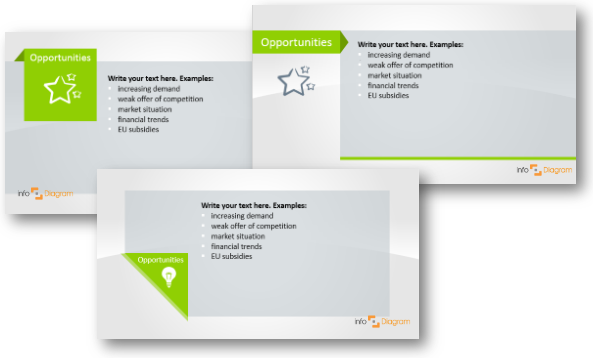 It uses modern flat graphics that can be included in an existing presentation. 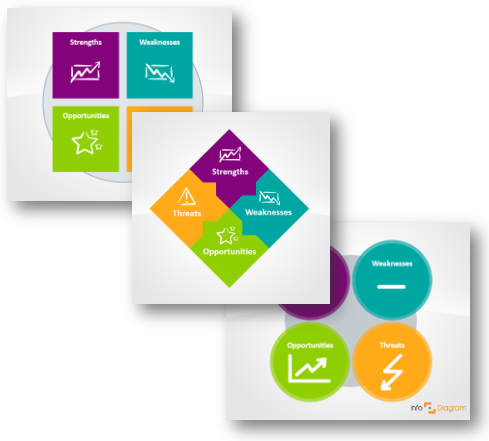 The SWOT collection contains 9 pre-designed SWOT diagrams and 12 unique editable icons representing Strengths, Weaknesses, Opportunities and Threats. However, it is better to see one time, so explore SWOT set by yourself 🙂 All templates and icons are fully-editable, so you can adapt colors to Your corporate style if you want. 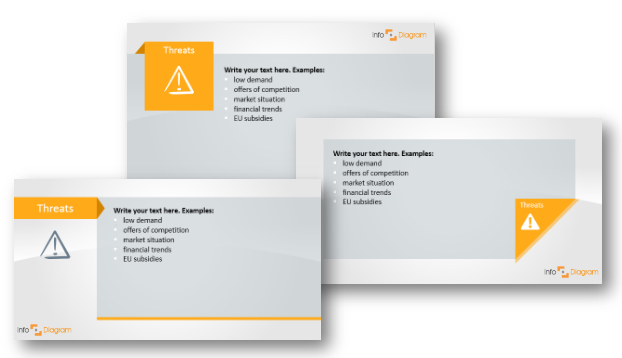 or get all pre-designed SWOT diagrams and editable icons with single pay-as-you-go purchase. Good luck making an awesome SWOT presentations.